I’m sure most of us have heard about the excessive homework issues that most school-going children are facing nowadays. While most parents are concerned about the excessive homework, we’re probably the odd ones who keep wondering why our boy doesn’t have any homework from his kindergarten. As for me, I’m not too concerned about the lack of homework. I feel that he should enjoy his preschool days – making new friends and learning new skills at school. When he goes into primary education, he wouldn’t be so “relaxed” anymore. Perhaps, my only concern is the culture shock that he may experience in future when he goes to P1 – the hectic lifestyle with daily homework, projects, extra-curricular activities etc. It’s going to be totally opposite from what he has in pre-school now. So, I’ve started to prep him for P1 by setting our own homework time. My objective is to make homework fun when he is young by cultivating his interest. Ideally, I don’t want him to feel being forced to do his homework. We bought him a new study table from IKEA few months ago, and we made it his study table for doing his homework. When it’s time to start, I’ll help him to set-up his table by taking his pencil case, coloring materials and workbooks. And I said, “Wow! You got some really interesting worksheets to do today. I’m going to give you 3 stickers if you can do it correctly!” Oh yes, my tone should sound really exciting and the stickers really do wonders for me. Some simple additions, he did it all by himself! As he does his work, I will praise him for his nice handwriting as a form of encouragement. If he needs to erase something or draw straight lines with a ruler, I’ll give him some assistance. 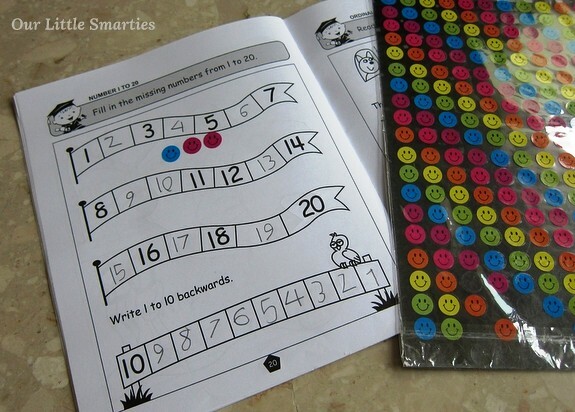 When he is finished with his homework, I’ll reward him with stickers. Trust me, these stickers are really useful. You can get them from Popular book store. His handwriting is quite neat, I think. Two important points to take note here: 1) make the effort to praise them, and 2) reward them for completing their homework on time. If we, parents, can create a positive vibe about homework, I’m certain that our children will enjoy it too. 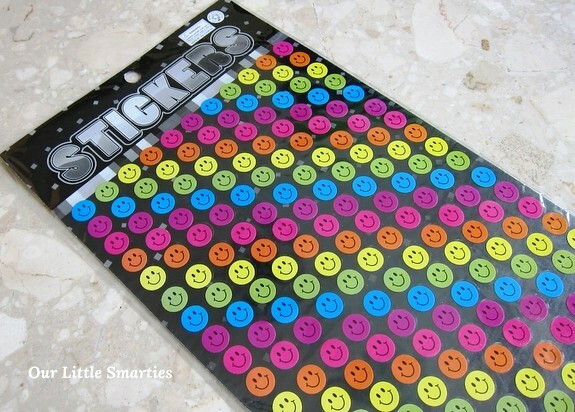 Colorful smiley stickers that work like MAGIC! 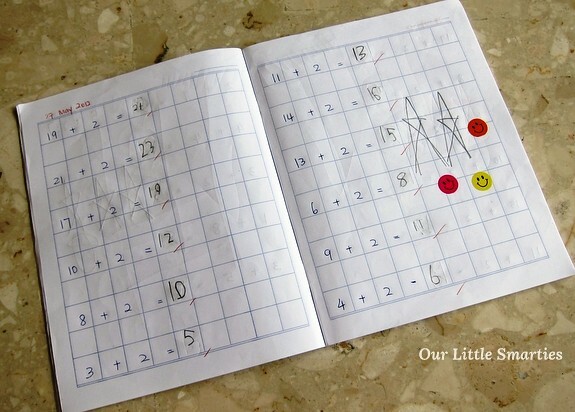 What’s your secret to create a love for homework in your kids? I love to hear from you too! Communicated with you sometime ago regarding choice of nursery schools cos my girl is same age as your son. i must say you are indeed a dedicated and patient mum. I do try reading to my daughter and practising with her phonics but stop short of worksheets. I have invested in lots of stuff and should make the discipline to start her on it soon. I am pretty impatient rather then encouraging so must make an effort at that too! Thanks for your kind comments. Indeed it takes a lot of time and patience to practice at home, even when our kids are attending preschool or enrichment classes. I am constantly pushing myself to do better for my son. I’m sure you’ll do the same too. Jia you! Here is a great site with lots of free educational games for kids. http://www.teacherspayteachers.com/Product/Memory-Board-Game-with-Dinosaur-theme. Enjoy!